One of the major transitions in young Hutterites has to be turning 15. The 15th birthday has a special implication because it signals a transition from childhood to adulthood: it’s when a girl becomes a dien and a boy turns into a buah. (A dien is an unmarried female over the age of 15 and a buah is an unmarried male over 15.) This transition encompasses major changes in young people’s lives: they no longer eat in the children’s dining room, they are considered adults by members, they take part in the buem and diene activities, and they are given more responsibilities. On the day of birthday, they still continue to go about their daily lives; all their chores and responsibilities remain as before. On Hutterite colonies, children aged 5 and eat their meals separate from adults in the essenschuel, or children’s dining room. At supper time, the birthday boy or girl will announce to the German teacher that he or she is 15 years old and the German teacher will commence with an admonishment about their new transition and responsibilities. For example, they are now expected to pray privately morning and night, whereas up to this point they had prayed together with all the other children in the essenschuel. Often the German teacher will share advice about how to behave, how to avoid the dangers and pitfalls in their transition to adulthood, and provide guidance for helping their personal growth, especially in the faith. Following this admonishment, the birthday lad or lass is considered a buah or dien. One of the changes for young people involves the move from the children’s dining room (Essenschuel) to the adults’ dining room (Ess Stubm). In the adults’ dining room, they will take their ordered place on the men’s side of the room. The seating arrangement is specified with the oldest unbaptized young man sitting across from the most senior adults and so on down the line. The newest buah will sit next to the next youngest buah across from one of the older members. 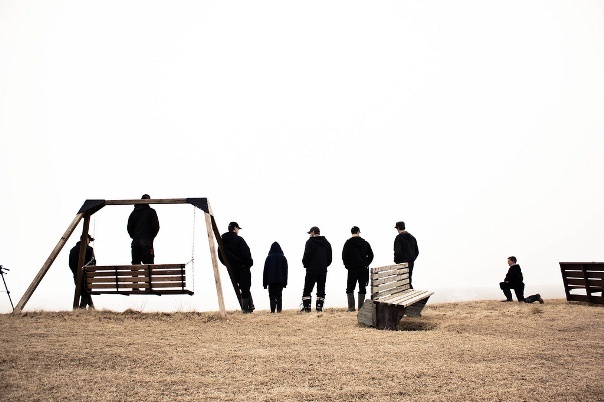 Young Hutterites look forward to socializing with other buem and diene once they turn 15. They often spend time together doing various activities, from visiting to travelling to other colony, to working on various projects and jobs. This provides opportunities for them to meet new buem and diene and to socialize. It used to be that once a child hit the age of 15, they left school and started working in one of the many colony enterprises. With high schools becoming more prevalent, especially among the Schmiedeleut, the formal joining of the workforce is pushed off until graduation. However, all buem are assigned a job, as an apprentice somewhere on the colony. Typically they will work in this enterprise for a year or until they are needed somewhere else. If they attend school, they will work at their appointed job after school, on Saturday and on school holidays. Turning 15 is an important time in Hutterite young people’s lives. Although they often lead a looser life, they are always encouraged by baptized adult members, in Sunday school and during the church services to take this time to grow spiritually and not to allow bad habits to form. This is one area where we as Hutterites need to support our young people, to allow them some freedom, but never to condone sin or improper behaviour. These formative years are a time for us to be patient, to help guide, and to encourage them to make the right decisions for themselves and the community. It’s the hope of every Hutterite parent that their children will one day decide for themselves to join the Hutterite Church and become members in the community of believers.